AT&T Wireless has started to ship the Nokia 6820. The phone was announced back in October 2003, but is an AT&T Wireless exclusive. 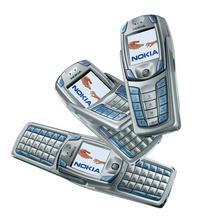 It is an updated version of the Nokia 6800. The biggest feature of the Nokia 6820 its fold-out QWERTY keyboard that works exactly like the one in the 6800. New features to the 6820 are: * Integrated camera * Bluetooth * EDGE high-speed data The addition of EDGE should make the Nokia 6820 a hot item for business users (a QWERTY keyboard with a high-speed net connection plus Bluetooth means lots of fun). Here are some other features: * XHTML browser * Java * Notes application (can be sent to computer) * Integrated speakerphone You can buy it now for $349.99 before rebates. There is no word on what rebates are being offered, but it will likely depend on the length of contract (1 or 2 years). To supersize the image, just click the thumbnail.